Imperium is a fictional biography of Cicero written by Robert Harris. In the dictionary, the definition of the word Imperium goes: absolute power, power to command, the supreme power held especially by consuls and emperors to command and administer in military, judicial and civil affairs. 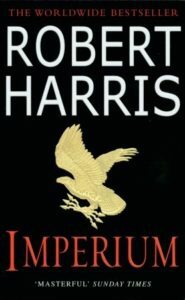 In Robert Harris’ Imperium, my interpretation of the title is: it signifies the process that Marcus Tullius Cicero, seen by the aristocratic class as a “new man”, climbed up the political ladder step by step. Cicero’s ambition of “conquer Rome” had to start with becoming a senator, which required an asset of one million sesterces. Without family fortune, he faced the three traditional options. “But making it would take too long, and stealing it would be too risky. Accordingly, soon after our return from Rhodes, he married it.” From there onwards, Cicero launched his political career as the most junior of the magistracies, with the official title of quaestor, followed by aedile, praetor and finally elected consul at age 43 in 63 BC at the end of this book. I enjoyed reading the paperback and also listening to this book. The audiobook narrated by Simon Jones is one of the very best audiobooks that I have heard last a few years. Robert Harris’ exquisite writing together with Simon Jones’ performance brought me back to Rome of more than 2000 years ago and induced me into a long-lasting illusion that I was there in person vividly seeing all the characters, hearing the speeches, standing in the Forum listening to the debates, watching people casting votes in the Field of Mars. I admired the author’s superbly brilliant story-telling skill coupled with his mastering of the English language. Upon finishing reading it silently, I found myself elevated to another level of pleasure by reading some passages aloud. I see and hear from Cicero, the “Dancing Master” and the foremost orator of the time Quintus Hortensius Hortalus, Tiro, Quintus, Lucius, Crassus, Pompey, Atticus, Caesar, Terentia and many others right around me. It is extraordinary how a beautifully-crafted book could do to one’s perception and imagination. Among all the passages, not surprisingly, I admire the speeches that Cicero gave most, which I shall share with you shortly. The biggest drawback of reading this book is that I fear to proceed to open Lustrum (2nd volume) and then Dictator (3rd volume) of Robert Harris’ trilogy about the life of Cicero. This first volume Imperium is about the rising of the most formidable and esteemed lawyer, the greatest orator, the brightest political star in Rome at the time; eventually reaching the ultimate consulship. Without reading the 2nd and 3rd volume, consulship appears to be the climax of Cicero’s conquering of Rome. Logically speaking, what could you expect from the next two volumes? I purposefully delay my reading of the subsequent volumes to live in Cicero’s glorious period for a bit longer, despite the strong temptation of indulging myself in the Cicero’s consul and post-consul era. We are aware with what jealousy, with what dislike, the merit and energy of “new men” are regarded by certain of the “nobles”; that we have only to shut our eyes for a moment to find ourselves caught in some trap; that if we leave them the smallest opening for any suspicion or charge of misconduct, we have to suffer for it at once; that we must never relax our vigilance, and never take a holiday. We have enemies – let us face them; tasks to perform – let us shoulder them; not forgetting that an open and declared enemy is less formidable than one who hides himself and says nothing! A trivial incident, you might think, and yet Cicero himself used to say that this was the instant at which his ambition hardened within hi to rock. He had been humiliated – humiliated by his own vanity – and given brutal evidence of his smallest in the world. He stood there for a long time, watching Hortensius and his friends partying across the water, listening to the merry flutes, and when he turned away, he had changed. I do not exaggerate. I saw it in his eyes. Very well, his expression seemed to say, you fools can frolic; I shall work. Followed by Cicero’s voice: This experience, gentlemen, I am inclined to think was more valuable to me than if I had been hailed with salvoes of applause. I ceased thenceforth from considering what the world was likely to hear about me: from that day I took care that I should be seen personally every day. I lived in the public eye. I frequented the forum. Neither my doorkeeper nor sleep prevented anyone from getting in to see me. Not even when I had nothing to do did I do nothing, and consequently absolute leisure was a thing I never knew. Cicero’s mentor Molon said to him, Content does not concern me. Remember Demosthenes: Only three things count in oratory. Delivery, delivery and again delivery. Few subjects make more tedious reading than happiness. Cicero: The most fatal error for any statesman is to allow his fellow countrymen, even for an instant, to suspect that he puts the interests of foreigners above those of his own people. That is the lie which my enemies spread about me after I represented the Sicilians in the Verres case, and that is the calumny which I can lay to rest if I defend Fonteius now. Here is a passage describing the scene that Cicero’s cousin Lucius attempted to defeat him in an argument: Words, words, words, is there no end to the tricks you can make them perform? But, as with all men, your greatest strength is also your weakness, Marcus, and I am sorry for you, absolutely I am, because soon you will not be able to tell your tricks from the truth. And then you will be lost. I chewed on these few sentences as I suspect it will be manifested in volume 2 and 3 in what followed. If you find yourself stuck in politics, the thing to do is start a fight—start a fight, even if you do not know how you are going to win it, because it is only when a fight is on, and everything is in motion, that you can hope to see your way through. There is nothing quite like death to make one feel alive. Roman is not merely a matter of geography. Rome is not defined by rivers, or mountains, or even seas; Rome is not a question of blood, or race, or religion; Rome is an ideal. Rome is the highest embodiment of liberty and law that mankind has yet achieved in the ten thousand years since our ancestors came down from those mountains and learned how to live as communities under the rule of law. So if his listeners had the vote, he would conclude, they must be sure to use it on behalf of those who had not, for that was their fragment of civilisation, their special gift, as precious as the secret of fire.